PowerForward is a web-based app that helps businesses build team synergy and help individuals develop leadership skills based on Coach K’s philosophies and methodologies. Michael William Krzyzewski, also known as “Coach K”, is the all-time-winningest men's college basketball coach, developing hundreds of college and professional players over the last four decades, resulting in five NCAA Men's Div I BasketBall Championships and three Olympic gold medals. Built on the winning track record of Coach K, PowerForward takes his approach and uses the coach's keywords for success as a foundation for an impactful leadership and team development program. I worked as the sole Product Designer committed to improving the overall user experience as well as exploring new features enhancing the platform's value. I was responsible for and led the design from whiteboard brainstorms, paper/lo-fi prototypes, to high-fidelity screens. Extensive user research and testing also played a significant role as I wanted to ensure the product was as user-centric as possible. Outside of handling UX and design, I also wore the hats of a project manager and QA as we were an extremely lean team. Inheriting existing designs mean I didn't have that much creative freedom. However, by taking elements from it and tightening up the design, I was able to make it feel brand new while keeping a sense of familiarity. One of the first things I established was a style guide giving our marketing site and app a clear visual hierarchy. Before tackling any major overhauls to the app's current design, I wanted to make sure that the flow of the platform made sense to the users. One major issue I've encountered was the user creation process. We were relying solely on a reset password token to create the user's initial password. This caused a great deal of headache as our invite link would "expire" once its clicked, regardless if they finish creating their account or not. Working closely with our dev team, I suggested a much cleaner flow for onboarding new users. New features were also added for our admin portal as well. We ultimately wanted a much easier process creating new accounts and capturing usage data on current clients. Eventually, we would also add an automated email system alerting our users of any newly released content. Having a more robust admin portal allowed us to better service our users. User feedback is crucial, especially when a product is still new. It is that feedback loop that allows us to learn firsthand what our clients need. We were fortunate enough to have a large group in our pilot program to collect data from. I led in-depth interviews with our power users as well as users that have dropped off in usage to better understand their pain points and what led to that drop off. I also collected data from surveys to validate some findings as well as starting to plan for future features. By understanding current usage habits and pain points our users were facing, I set out designing a more efficient user flow. This would help our users maximize their time in our app, and help dictate what content we would be pushing and showcasing. We changed various features within our app as well. There were certain areas that were simply not being utilized and from the feedback collected, I was able to offer more engaging options such as goal setting and a lesson directory. Our lesson structure was revamped as a result of this - moving from a bi-weekly release to monthly. This gave our users more time to consume and discuss the content. In order to give our app a facelift, I started testing with simple paper prototypes validating certain features to ensure it is what users want and need. I later moved to lo-fidelity wireframes to get a better feel of the site's final layout before moving into the high-fidelity versions. Testing was done at every iteration - I would much rather make small minute changes now rather than large time-consuming ones later on. The redesign gave our app a much cleaner and modern look, with easy access to functions and features our users want. It also gave us more control directing our users in the site resulting in less dead ends. I've also started laying down the groundwork for a new feature in our app, allowing our users to be connected with a coach. This creates a much more engaging experience - most importantly giving our users some sort of accountability as they progress through the lesson plan. 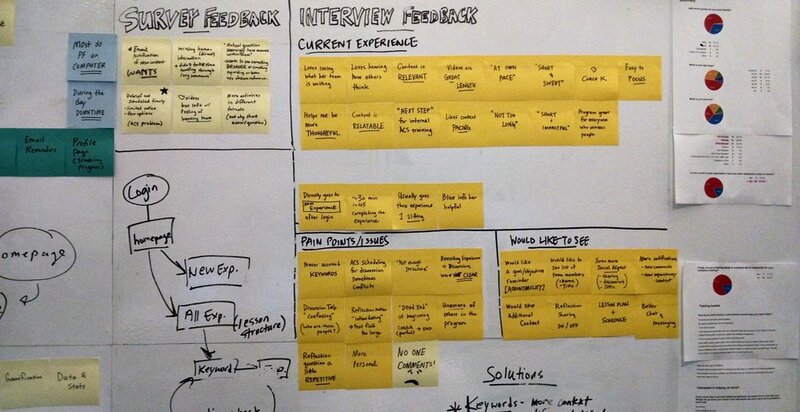 Establishing personas and user journey gives us a much clearer perspective of what to build.